Many New London residents are taking extra precautions to protect their pets after multiple reported coyote sightings and a few attacks. People have noticed coyotes in the streets, following them on walks, and some have reportedly attacked dogs. While coyotes aren’t new to New London neighborhoods, people said they seem to be too comfortable lately. “Seeing them during the day is a little shocking,” said Jonathan Burdick, who lives on Parkway South in New London. Burdick took a picture of a coyote on Glenwood Avenue, which borders his home. He’s concerned because he has two outdoor cats and three kids, one of which is a toddler. 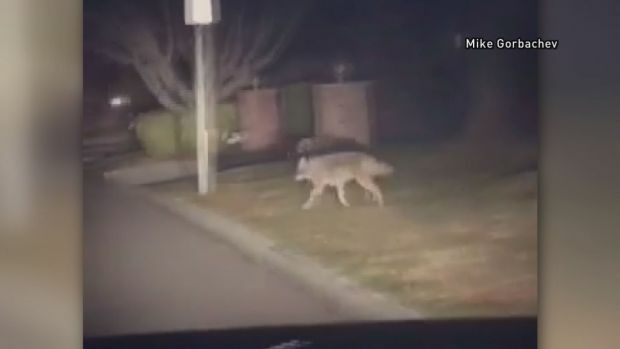 “I was getting the kids ready to put in the car and bring them to school and was shocked to see the coyote out by the back of the car,” he said, comparing the size of the animal to a German Shepard. One resident, Corina, said coyotes had mauled her puppy just a couple of weeks ago. “He had a gash on him, his muzzle was bloodied, his eye – just now he doesn’t have a black eye,” Corina said. Jon Colburn works on Glenwood Avenue and said the coyote he’s seen don’t scare easily and walk right in the middle of the street or on people’s lawns. Colburn said a woman who lives near his place of work had her dog killed by one. “Said she watched the dog, her little dog, get taken by the coyote right through the backyard and through everybody’s yard. She said she chased it, and it wouldn’t drop it,” Colburn said. Acting New London Police Chief Peter Reichard said he’s hearing complaints about coyotes mostly from the southern end of the city. While officers and animal control are investigating claims, animal control is not able to handle wildlife. Mayor Michael Passero said the city could hire a licensed Nuisance Wildlife Control Officer by submitting a permit application through the Department of Energy and Environmental Protection (DEEP), but the city doesn’t meet the requirements. Neighborhoods around Ocean Beach have been posting their sightings and concerns on on-line neighborhood groups. Phyllis Teeson, who also lives on Glenwood Avenue, said because of the several coyote sightings, she’s extra cautious when she takes walks. “(The coyote) came out between houses and I frightened him, maybe, because we just sort of stared each other down. Now I carry a stick with me when I go out walking,” Teeson said. A Wildlife Biologist from DEEP addressed the community concerns Monday night at Nathan Hale Arts Magnet School. “What going to happen when a child corners this coyote and it rips its face off?," asked New London resident Lisa Darling. She was among a large crowd who was raising concerns to police, the mayor and DEEP officials on Monday night. Several residents are worried about coyotes coming closer, being bolder and even going after family pets. “This thing is clearly not afraid of people. It’s not afraid of dogs," said Darling. Many of the people who attended the community forum at Nathan Hale Arts Magnet School said they wanted to be able to better protect their pets and themselves. “I have her on a leash. My garbage is covered. I don’t feed coyotes," said Mamie Bauduccio-Rock, a New London resident. She said she and her small dog had a run-in with a coyote a few days ago. "I looked behind me, in broad daylight, and one of the coyotes was running after us," said Bauduccio-Rock. Wildlife officials said much of the coyotes' behavior is based on human behavior. They advised residents not to give coyotes access to any food source - which could include a family pet. Pets should be secured and supervised at all times, a DEEP official said. City officials urged residents to document the whereabouts and actions of coyotes to give experts a better idea of the locations in which coyotes may have built dens. “It’s when through human interaction that they start to change their behavior that they become a problem," said New London Mayor Michael Passero. Members of the police department present at the community forum said they would respond - with force, if necessary - if someone is threatened by an aggressive or sick coyote. 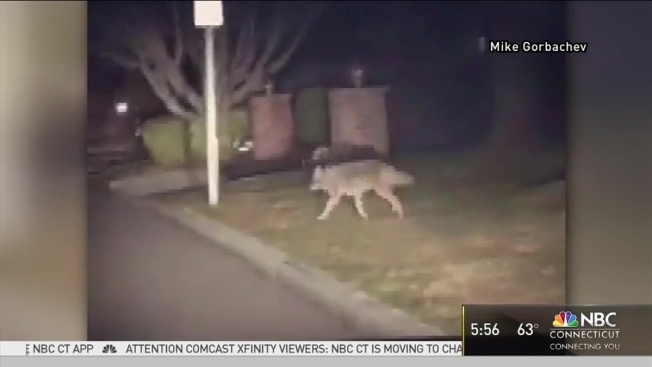 Dennis Schain, the spokesperson for DEEP, told NBC Connecticut in an email that coyotes are often out during the day and while, it’s a little unusual to spot them in urban areas, it does happen. They’re also not known to attack humans. But to scare one off, act 'big', stomp, yell and bang something until it goes away.